Like oranges or lemons, grapefruit also belongs to citrus fruits. This fruit contains some powerful health benefits because it comes with unique health-promoting and disease-preventing properties as well. Grapefruits are low in calories and high in fiber, and they consist of bioflavonoids as well as other plant chemicals that fight against serious diseases such as cancer, heart disease, as well as the formation of tumors. Especially, this citrus fruit is a powerhouse of vitamin C that helps improve your immune system. Apart from that, they are packed with vitamin A, vitamin B6, folate, potassium, thiamin, calcium, copper, iron, phosphorus, and magnesium. The intake of grapefruit helps reduce the chance of developing prostate cancer, according to the Asia Pacific Journal of Clinical Nutrition. It also is good for skin care because it is high in water content, which helps change the skin complexion. In fact, grapefruits contain nutritional benefits that are beneficial for the body in many ways. Let me discover top health benefits of grapefruit. As talked later, grapefruits are a rich source of vitamin C that acts as a powerful natural antioxidant. As a result, it helps fight against pathogens causing common colds as well as other infectious diseases. In addition, vitamin C even aids in early wound healing and helps maintain healthy connective tissue. Grapefruits also help reduce the frequent infection problems and common colds as well. Moreover, it reduces inflammation in the body, which in turn helps to treat osteoarthritis, asthma, and rheumatoid arthritis. Protecting against cancer is a great health benefit of grapefruit you should know. This fruit helps reduce the chance of the colon, stomach, bladder, esophagus and breast cancers. A study published in 2006 in Carcinogenesis recommend that consumption of grapefruit may help suppress the development of colon cancer. It fights free radicals, which ultimately cause deadly diseases like cancer because it contains the rich antioxidant property. Grapefruits are good for those trying to lose weight because they are naturally loaded with vitamin C, water, and fiber. The vitamin C content regulates fat metabolism and improves the function of the metabolic system, thereby aiding in fat-burning. In addition, its water and fiber content even aid in decreasing hunger pangs. If you are planning to lose weight, remember to include half of a fresh grapefruit or a cup of grapefruit juice before your meals. Grapefruits are also good for the heart health due to the presence of vitamin C in it. Grapefruits contain the high potassium content that acts as a vasodilator, thus helping the blood vessels as well as arteries relax. As a result, it helps reduce blood pressure and mitigates the risk of heart strokes and attacks. Eating higher quantities of a compound in grapefruits and oranges may reduce ischemic stroke risk, according to a study published in 2012 in Stroke: Journal of the American Heart Association. Grapefruits contain the flavonoid named naringenin that increases the sensitivity of the body to insulin and helps keep a healthy body weight. The American Diabetes Association suggests grapefruit for those suffering from diabetes. This low-glycemic food does not cause a spike in blood sugar after its consumption. 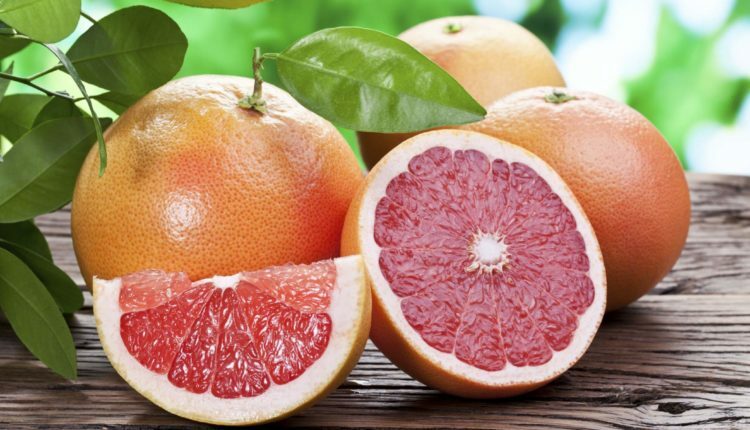 Grapefruits aid in managing degenerative diseases like cardiovascular disorders and diabetes thanks to its rich flavonoid content, according to a study published in 2010 in the Cardiovascular Journal of Africa. For diabetic patients, to help manage the blood sugar level, it is recommended to include ½ of a large grapefruit every day in their diet. Grapefruits comprise of the predominant flavonoid hesperidin that boosts good HDL (high-density lipoprotein) cholesterol and reduces bad LDL (low-density lipoprotein) cholesterol and triglycerides. A study published in 2006 in the Journal of Agricultural and Food Chemistry reports that just eating a grapefruit a day can reduce the levels of LDL cholesterol by 15.5 percent as well as triglycerides by 27 percent. Plus, grapefruits have the soluble fiber that prevents cholesterol from entering the bloodstream during digestion, thus triggering hardening of the arteries and reducing the risk of several cardiovascular issues and high blood pressure as well. 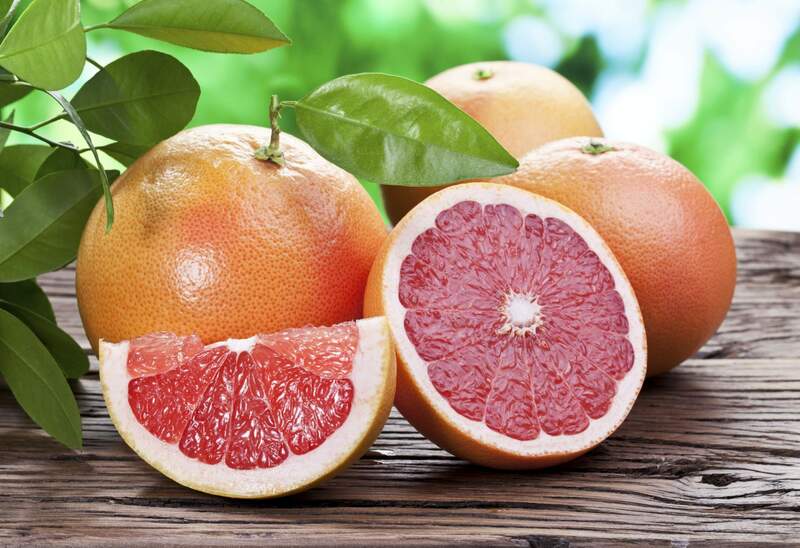 Red and pink grapefruits both are rich in beta-carotene that helps improve the vision and keep the eyes healthy. To combat the ravages of eye strain and maintain the vision, you just eat a grapefruit a day. The fruit is a powerhouse of vitamin A as well as flavonoid antioxidants such as naringin and naringenin. Plus, it is a rich source of beta-carotene, lycopene, lutein, and xanthin. These anti-oxidant agents are good for vision. Eating 2 grapefruits a day help to decrease gum bleeding. As mentioned above, grapefruit is packed with vitamin C that is good for healthy gums. Due to its vitamin C, grapefruits play a vital role in combating gum disease. Consumption of grapefruits daily reduced gum bleeding among people who suffer from the problem of gum disease, according to a study published in 2005 in the British Dental Journal. Thus, to prevent and combat gum disease, you just need to include 1-2 grapefruits in your diet a day. This citrus fruit is good for the skin health because it is loaded with vitamin C, which is essential for the healthy collagen production. As a result, it helps keep the skin smooth and plump. In addition, it comprises of antioxidant nature that fights the body’s cell aging by removing harmful free radicals. Apart from that, it reduces excess production of skin pigmentation, thus fading spots from the skin thanks to its mild acidic nature. Furthermore, grapefruits contain the potassium that guards the skin against harmful UV rays, thus reducing premature aging signs such as age spots and wrinkles. To enjoy the good skin, you should consume fresh grapefruit juice on a daily basis. You can also exfoliate your skin with the help of a grapefruit mask. You mix the juice of a half grapefruit, honey (1 tablespoon) and ground oatmeal (½ cup). Mix them well and apply the mask on your face. Let it dry and scrub off the mask using wet hands. This mask should be used once a week. Both grapefruit and its extracts contain the high amount of vitamin C. Generally, adequate consumption of this vitamin is imperative for growth and health of hair. Plus, vitamin C comes with strong antioxidant properties that help to promote the immune system and boosts the hair follicles. The hair follicles get clogged because of dandruff as well as dry flaky skin. If not treated, this damages the hair follicles and triggers hair growth. Luckily, grapefruit seed extracts help to combat bacteria on the hair and scalp. It aids in soothing the skin and removing dandruff. This also helps to promote new hair to grow and remove the follicles debris. Grapefruit juice is also imperative for hair’s health since it is full of vitamin C and A. Furthermore, it enhances blood circulation in your scalp encouraging hair growth. It is no wonder that this citrus fruit is so popular with all these benefits of grapefruits on health. Prior to eating grapefruit, don’t forget to check with a doctor because a lot of medications mix badly with this citrus fruit. Grapefruits consist of a compound known as furanocoumarins, which can spark negative outcome as combined with medicines. This guest post is by Hang Pham, a blogger with over 10 years of experience on searching the most effective remedies for beauty and health issues.